BEST SELLER | The Cameron Wig by Jon Renau is a lengthy bob with layered ends that create shape and movement. The sheer lace front allows you to change your look and style your hair away from the face. The monofilament top is hand-tied and creates multi-directional parting while providing the appearance of natural growth. This long bob is flattering for all ages and all face shapes. The SmartLace™ Front mimics a natural hairline and each hair is hand tied one by one. The top is made with a sheer material to create a scalp look and create natural volume. The entire cap has is hand-tied for comfort, natural movement, and styling versatility. 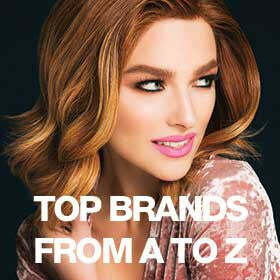 The synthetic hair is pre-styled with soft rounded layers and is ready-to-wear out of the box. Approximate Length: Front 10" | Crown 12" | Sides 7.75" | Nape 4.5"